We’re starting a brand new program and we think you’ll love it! It’s called “Band Practice” and it’s open to all intermediate and above students. This is an amazing opportunity to fine tune your musical abilities in a group setting. Each band will meet for a full hour every week and polish songs together. Over time, they’ll have a substantial set of tunes that are performance ready. Speaking of performing, that’s exactly what they’ll do! 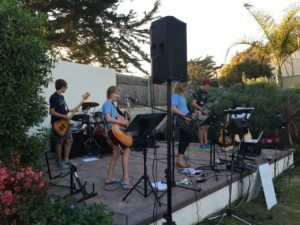 Besides obvious school opportunities (like chapels and talent shows), each band will be given multiple opportunities to play gigs around town. 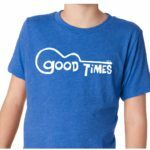 Good Times will book concerts at local venues like SoHo, etc, and the bands will hit the stage! This program is designed to accelerate student progress, make music more fun and save you money. The price will be just $115/month. We’ll plan to mostly meet 4x per month. If you miss a week here or there, no problem. The price is still $115/month. Occasionally, we’ll meet five times instead of four. Other months, we’ll skip a band practice due to a holiday, etc. It’s like Netflix – same price every month. The important thing is that you will want to BE in the band! We’ll be learning, having fun and playing shows. What could be better? Although students will be in a small group setting (3-5 per band), individual attention will still be given. New skills, chords, scales and theory will be shown to each student as we work through the material. The program will run from September until the end of May. We anticipate this program filling up quickly. Please register today to be sure your spot is secure! Register HERE. **NOTE: If your student is still a beginner, we recommend sticking with regular lessons until basic skills are up to speed. Band Practice will be waiting for them when they’re good and ready! Register for lessons HERE. If you’re not sure if your student is ready, just ask! We’ll help you evaluate their readiness.